IDS and IRSE to discuss what’s next for Rail Technology? 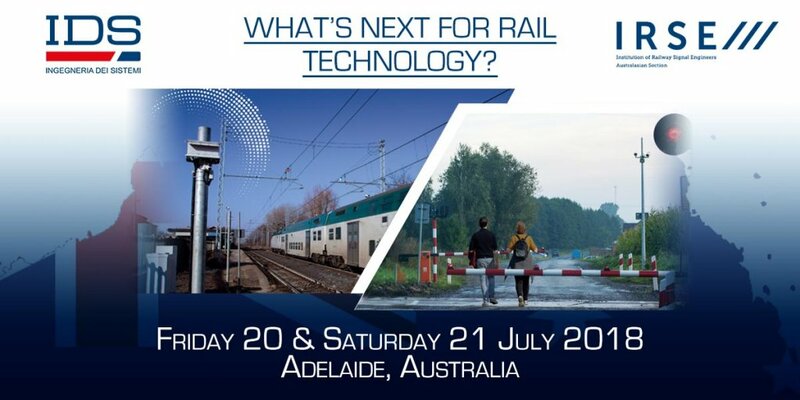 IDS announces that it will have a trade display and provide Sponsorship at the Technical Meeting organised by the Institution of Railway Signalling Engineers – IRSE, taking place in Adelaide (Australia), from Friday 20th to Saturday 21st July 2018. We are looking forward to meeting railway and level crossing safety experts from around the world to discuss and contribute to “what’s next for Rail Technology?”. The Technical papers will be presented on Friday at the Conference and Gala Dinner. Technical Inspections will be conducted on Saturday and will include the new Adelaide Metro Train Control Centre at Dry Creek and the Advanced Train Management System – ATMS Test Facility at the Australian Rail Track Corporation – ARTC project office, located in Mile End.